Is an iMac Desktop the Right Computer for You? The Apple iMac is a superb desktop computer that combines the power of the seventh-generation Intel i5 or i7 core processor with your choice of a 21.5-inch or 27-inch display, plus a large helping of Apple's well-deserved reputation for style. The result is a gorgeous, all-in-one desktop Mac that has been setting industry trends since its debut in 1998. Every all-in-one computer requires at least a few tradeoffs. Before you decide that an iMac would look stunning on your desk, let's take a closer look at some of the tradeoffs and see whether an iMac is a good fit for your needs. The iMac's design limits the types of expansion that end users can perform, but that's not necessarily a bad thing. This design decision allowed Apple to devise a great-looking, compact machine that has all the features many individuals will ever need. The iMac was created for individuals who spend most of their time working with computer software, and little or no time tweaking hardware. This is an important distinction, particularly if you enjoy fiddling with hardware more than you realize. But if you just want to get the work done (and have a little fun), the iMac can deliver. The iMac may not be particularly flexible when it comes to user-configurable hardware, but depending on the model, the iMac can have no user-accessible RAM slots, two user-accessible RAM slots, or four user-accessible RAM slots. The recent versions of the 21.5-inch iMac dropped user-accessible RAM slots in favor of either internal slots that would require complete disassembly of the iMac to change RAM, a very difficult task, or RAM that is directly soldered to the iMac’s motherboard. If you're considering the 21.5-inch iMac, you may want to order the computer with more RAM than the standard configuration since you won't be able to upgrade the RAM at a later date, at least not easily in most cases. The 27-inch iMac, regardless of the model, still has four user-accessible RAM slots, allowing you to expand the RAM yourself. Apple even provides detailed instructions on how to access the RAM slots and install new RAM modules. And no, you're not stuck buying RAM from Apple; you can buy RAM from many different third-party suppliers. Just make sure the RAM you purchase meets the iMac’s RAM specifications. If you’re considering purchasing a new 27-inch iMac, consider buying the iMac configured with just the minimum RAM, and then upgrading the RAM yourself. You can save a nice chunk of change this way, which can leave you some cash for buying apps or peripherals you may need. The 27-inch iMac Pro is the newest model of the iMac, released in December 2017. The iMac Pro boasts impressive ​specifications including up to 18 processors cores, RAM upgradable to a ridiculous 128GB, a Radeon Pro Vega designated (up to 16GB) video card, and a choice of a 1TB, 2TB, or 4TB solid-state drive. The iMac Pro does not have any RAM access panels, but with the base model coming with 32GB; and the intended users of the iMac Pro usually knowing their usage before shopping for a new computer there isn't much need for it. The iMac is available in two display sizes, and displays in two different resolutions. Before we take a look at Retina or Standard displays, let's start with the question of size. It's often said that bigger is better. When it comes to iMac displays, at least, this is certainly true. Available in 21.5-inch and 27-inch versions, both iMac displays perform well, using IPS LCD panels with LED backlighting. This combination provides a wide viewing angle, a large contrast range, and very good color fidelity. The only possible downside to the iMac’s display is that it's only offered in a glossy configuration; no matte display option is available. The glossy display produces deeper blacks and more vibrant colors, but at the possible cost of glare. Thankfully, new iMacs, especially those using the Retina display, come equipped with an anti-glare coating that really helps keep glare at bay. Apple currently offers the iMac with two display types for each size. The 21.5-inch iMac comes with either a standard 21.5-inch display using 1920 by 1080 resolution, or a 21.5-inch Retina 4K display with a 4096 by 2304 resolution. The 27-inch iMac is only available with a 27-inch Retina 5K display using a 5120 by 2880 resolution. Early versions of the 27-inch iMac also had a standard display available at 2560 by 1440 resolution, but all recent models make use of the higher resolution Retina 5K display. Apple defines Retina displays as having a high enough pixel density that a person is unable to see individual pixels at a normal viewing distance. So, what is a normal viewing distance? When Apple unveiled the first Retina display, Steve Jobs said a normal viewing distance was about 12-inches. Of course, he was referring to the iPhone 4. It's hard to imagine trying to work at a 12-inch distance from a 27-inch iMac. 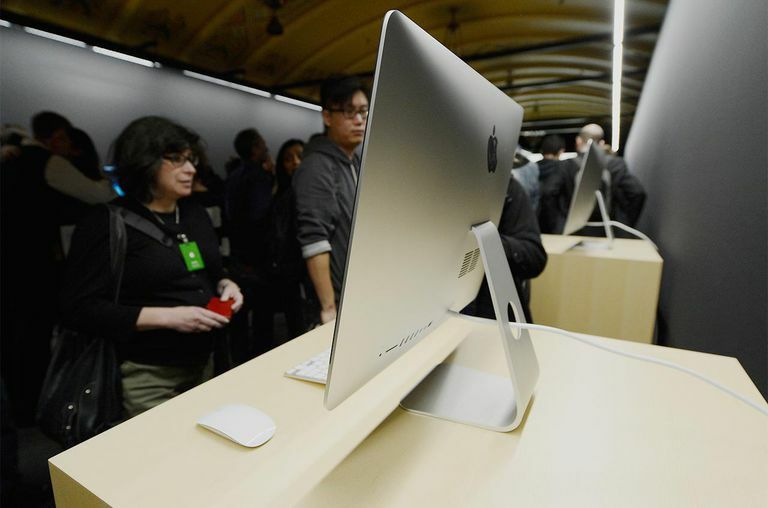 The average working distance from a 27-inch iMac is more along the lines of 22-inches or more. At that distance, you can’t see individual pixels, resulting in one of the best-looking displays you've ever seen. Besides the pixel density, Apple has gone to great effort to ensure the Retina displays have a wide color gamut, meeting or exceeding the DCI-P3 gamut range. If you worry about color space, then the iMac’s Retina display is an excellent choice. It may not match high-end color monitors, but remember, when you buy an iMac, you're getting a Mac computer and a display for less than the cost of some 5K monitors by themselves. Storage: Bigger, Faster, or Both? From there, you can step up to a Fusion drive, which combines a small PCIe flash storage drive with a 1, 2, or 3 TB 7200 RPM hard drive. The Fusion drive gives you the best of both worlds because it's able to offer better speed than just a hard drive, and much larger storage space than most SSDs. If the Fusion drives don't meet your needs, and speed is what you need, then all of the iMac models can be configured with PCIe-based flash storage systems, from 256 GB through 2 TB. Remember, you won't be able to easily change the internal hard drive later, so pick the configuration you can comfortably afford. If cost is really an issue, don't feel you have to blow the budget up front. You can always add an external hard drive later, although that somewhat defeats the purpose of an all-in-one computer. The iMac models provide for external expansion using Thunderbolt 2 and USB 3 ports. The iMac’s graphics have come a long way since the earlier models. Apple tends to vacillate between AMD Radeon graphics, NVIDIA-based graphics, and Intel integrated GPUs. Current models of the 27-inch Retina iMacs make use of AMD Radeon Pro 570, 575, and 580. The 21.5-inch iMac uses Intel Iris Graphics 640 or Radoen Pro 555, 560. And the iMac Pro gives users the option of the Radeon Pro Vega 56 with 8 GB of HBM2 memory or the Radeon Pro Vega 64 with 16 GB of HBM2 memory. While the Intel graphics options are good enough performers, the AMD Radeon discrete graphics are a much better choice for those who work professionally with video and photos. They also offer a good deal more performance when you need to take a break and play a few games. A word of caution: Even though we mentioned that some iMac models make use of discrete graphics, that doesn't mean you can update or replace the graphics. The graphics, while using discrete components dedicated to graphics, are still part of the iMac’s motherboard design, and aren't off-the-shelf graphics cards that can be purchased from third parties. You can’t upgrade the graphics at a later date. So, What Are the Advantages of an iMac? The iMac offers many advantages over traditional desktops. Aside from an obviously smaller footprint, the iMac also has a very good quality, large, widescreen display that could easily cost anywhere from $300 to $2,500 if purchased as an equivalent standalone LCD display. The iMac comes bundled with some of the same attractive and useful hardware and software that comes with a Mac Pro. The iMac ships with a built-in iSight camera and microphone, built-in stereo speakers, a Bluetooth keyboard, and a Magic Mouse 2. Is an iMac Right for You? The iMac is a great computer, one that is solid choice for most individuals. The built-in display is wonderful. And let's face it: The iMac's form factor is without a doubt one of the sleekest and best available for a desktop computer. Despite its obvious appeal, the iMac at least in its base configurations is probably a poor choice for advanced graphics and video professionals, who need more robust graphics than is available in the entry level iMac. Graphics and video pros are also better served by more RAM expandability and more drive storage options, features that make the 27-inch iMac and the Mac Pro a better choice for their needs. On the other hand, the iMac, especially those with a Retina display, may be just the right choice for any pro or amateur photographer, video editor, audio editor, or just plain multimedia junkie who is looking for outstanding performance without breaking the bank.